Cooking on a fire pit can be a really fun activity, and can produce some remarkably tasty food as well. Whether it’s in the backyard with a fire bowl, at the beach at a fire pit, or camping around a rumble stone fire pit, cooking a satisfying, healthy, enjoyable meal with friends and family will create wonderful memories. After looking at several of the Best Fire Pit Grates for Cooking available on the market, we have determined that the best all around grate is the Texsport Heavy Duty Swivel Cooking Grate [Amazon Link]. The Texsport Swivel Cooking Grates are highly functional, with a post system that allows the grate to be suspended at virtually any height above the fire bowl. This negates the need to get a perfect size match between bowl and grate and allows for flexibility when cooking. And best of all, these are among the cheapest fire pit grates on our list. They are a great choice for many circumstances and are ideal fire pit bbq grates. 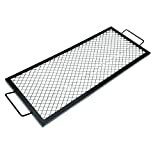 For a complete review of the Texsport Heavy Duty Swivel Grate, see our Product Reviews section below. The Sunnydaze X-Marks Round Grill Grates [Amazon Link] are a good quality backup choice for fire pit grilling. These round grill grates are available in seven different size options (prices are dependent on size), are made of steel, and have an X-Mark grate shape that will sear your food in an X-shape, creating an appealing meal! These do not have any height adjustment options, which is a downside, and they may warp a little bit upon first exposure to high heat. But they are high quality and are covered under a 1-year warranty by Sunnydaze, which is a nice extra. If you need a circular grate and don’t need much height adjustment, the Sunnydaze line is a solid choice. 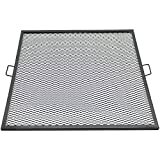 For a complete review of this line of fire pit grill grate, please see below. 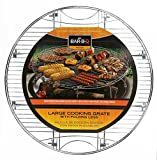 For those on a budget, the Mr. Bar-B-Q Large Round Cooking Grate [Amazon Link] is an excellent choice for many circumstances. The fact that these grill grates have locking, fold-down legs means that the height of the grill can be adjusted, and the grate does not need to sit directly on the fire pit lip. This allows for easier cooking and better quality of food. These units are 26″ in diameter, and also feature a raised outer edge that prevents food from tumbling off of the grate and into the fire. They are an excellent budget choice for fire pit grates. For a complete review of these grates, see our Product Reviews section below. We have narrowed our product guide down to five different brands and options, which we look carefully at in this section. There are a variety of different designs shown here, with different shapes, configurations, quality levels, and prices. We consider the positives and negatives of each. For a general guide to cooking with a fire pit, see here. The Mr. Bar-B-Q round cooking grate is an excellent choice for fire pit cooking. It features four fold-down legs which allow the grate to be situated some distance from the underlying fire. It also has a raised edge that helps prevent food from spilling over the side and into the fire pit. The Mr. Bar-B-Q round cooking grate is a nice choice for those with a small fire bowl (between 21″-29″), or those who want to cook on camping fire pits. The legs fold down, and while this fire pit cooking rack fits neatly in fire pits from 21″-29″, it could work inside larger fire pits, depending on the location of the lip, and where logs are placed. It is best to measure your fire pit to envision where a 26″ round grate would sit. The experience of cooking with this fire pit grate is good. It is made of sturdy metal and feels solid. The legs lock into place, and it is easily positioned on a fire pit with room to spare to allow for log placement. One of the challenges when cooking using a fire pit is to get the grate at the proper height for cooking. If the logs are too close, you’ll get a tendency to burn your food; if it’s too far away, cooking will be slower, and you’ll get more smoke. With the included legs on this fire pit grate, you can get your cooking surface at the exact right height for your needs. The cooking surface is large, and the experience of cooking over a fire pit is a fun one. The outer ledge is a nice extra, and definitely helps when placing food on the grate, or taking it off. The Mr. BAR-B-Q Large Round Cooking Grate is an excellent choice for those looking for a fire pit grate, at a bargain price point. This unit is well designed and solidly built, makes cooking over a fire pit a breeze, folds up for storage and transport, and is an all around good buy. The fact that the lockable legs are included, which enables users to raise the grate up off the fire pit ledge (if desired) is a useful plus and allows for more fine-tuned cooking than some of the other grates on our list. Given the specs and utility of this grate, if it will fit your size requirements, this is an excellent choice for a fire pit cooking grate. The Sunnydaze X-Marks Square Fire Pit Cooking Grill is a nice choice for a square fire pit cooking grate. It is shown here in the 40″ format, but it is available in five size options. It will typically be used with square fire pits, but it can be adapted to other circumstances. As is shown here, this grate can be used in both square and round fire pits. If you plan to use it with a round fire pit, consider the diagonal length of the grate (see dimensions for more information). 24" 24" 28" 1" 33.9"
30" 30" 34" 1" 42.4"
36" 36" 40" 1" 50.9"
37.5" 37.5" 41.5" 1" 53.03"
The Sunnyedaze X-Marks Fire Pit BBQ Grill inserts are very robustly made units, constructed of steel, and built with two handles to make placement and removal of the rack fairly simple. The interior mesh of the grate has an X-shaped design, which leaves a cool X-shaped grill mark pattern on your food. Attractively-shaped sear marks are always a nice touch when it comes to outdoor barbecuing. It does not feature any legs, so the height of the lip is the height of the grate. Be sure to consider the height of the unit when purchasing, as you want to make sure there is appropriate breathing room between the fire and the grate. The Sunnydaze X-Marks grill may warp a little bit upon first exposure to heavy heat, but it should not impact your grilling in any significant way. It is very strong, and could theoretically hold up to 400lbs, so you can even cook dinosaur steaks on these grills! This grill could rust if exposed to the elements for any significant period of time, so plan on storing it out of direct contact with the elements when not in use. A deck box is a decent solution, but there are a variety of different storage options available. Be sure that the unit is fully cooled before storage! In general, the paint will flake off over time, and before each cooking use, you should probably give it a good scrub with a wire brush to get any bits of food or paint off of it. It does not seem that the paint sticks to food at all, regardless. The Sunnydaze X-Marks line of grills grates is a nice choice for many applications. These have handles for easy placement/removal, they have a very solid design and an attractive X-shaped grilling surface. With a 1 year warranty, the Sunnydaze selection is high quality and is backed by a 1-year warranty. About the biggest concern with these is that they may warp a bit, especially on their first exposure to fire. Not a huge deal in our eyes, though. While not cheap, Sunnydaze has put together a nice product line with these square fire pit grill grates. The Onlyfire Rectangular X-Marks cooking grate appears quite similar to the Sunnydaze Square X-Marks cooking grate, but these units have a rectangular shape that may be more useful for some who want to turn their fire pit into a fire pit grill combo. With four sizes to choose from and sturdy steel construction, these cooking grates feel solid and will leave appealing X-shaped sear marks on your food. 32" 32" 36" 15" 1"
36" 36" 40" 15" 1"
40" 40" 44" 15" 1"
44" 44" 48" 15" 1"
The Onlyfire Fire Pit Rectangular X-Marks grill grate selection is pretty similar in quality to the Sunnydaze set mentioned above. The size configuration is obviously different, and the rectangular setup may be more useful to some users than a square design. The Onlyfire has no legs, and no ability to easily raise the grate up off of the cooking surface, so consider the height of the unit when looking at size options. If you need extra height between the lip of the fire pit and the grilling surface, you may want to look at another option on the list. These grates provide a large cooking surface and are capable of handling a good deal of weight, at least 100lbs. Like the Sunnydaze mentioned above, this grill surface is made of steel and is painted with high heat paint. It may experience some sagging upon first exposure to heat, so beware that this may occur. It shouldn’t negatively impact the overall performance of the grate, but it may be a minor aesthetic issue to some. As this grate is not treated for outdoor exposure, you should be sure to store it when not in use, out of the elements. Of course, be sure that the grate is fully cooled before storage! Also, plan to scrape the grate with a wire brush after use to ensure that everything stays clean. Overall, the Onlyfire cooking grate is a nice choice for those looking for a rectangular cooking surface. These are built with pretty similar construction to the Sunnydaze grates mentioned above, and buyers should anticipate some minor warping upon exposure to heat. That said, these are not significantly cheaper than the Sunnydaze square cooking grates but lack the 1-year warranty Sunnydaze offers, which is a negative. There is also no easy way to manipulate the height of the grates, as there are no legs included. If this is a requirement for your needs, it is best to look elsewhere on this list. Texsport Swivel Grill, the Best Fire Pit Grates Available! The Texsport Heavy-Duty Barbecue Swivel Grill system is a nice design and has some practical features that make cooking over a fire pit a bit easier than some of the other fire pit cooking grates on our list. The primary differentiation is the included post, which allows the grill surface to be adjusted to virtually any height above the fire pit. This design negates the need for a perfectly-fitting grate and allows the grate to be swiveled away from the fire when needed. The post on the Texsport Heavy Duty Barbecue swivel grill features a pointed bottom stake design, which gets inserted into the ground at the edge of the fire pit. This holds the grill up and allows for the grill surface to be positioned at pretty much any height above the fire. It is an excellent design, but if the soil is too hard, it can be hard to get this stake all the way in. If it’s too soft, the soil could collapse and drop all of your precious food into the fire, etc. Great care should be taken in ensuring that this stake is properly inserted, and be sure to pay attention to any signs that the post is leaning during the cooking process. Pound that stake into the ground solidly! That said, the design results in a sturdy setup and can be used even in sand, if pounded in the ground far enough, with a hammer. If you’re going to use this in the same place most of the time, it’s a good idea to sink the post into the ground as solidly as possible and leave it there. You can take the grate off when you’re done cooking, and leave the post, even if you’re using the fire pit for bonfires. The grate itself is made of cast iron and is pretty sturdy. It can hold a good deal of food, and the attached clamps make cooking food on the post fairly easy. The clamps ensure that the grate is secured to the post, and also allows the grate to be rotated as needed away from the fire. This makes placing food on and off of the fire pit cooking grate a cinch! You can cook a good deal of food on this grate, and it will leave attractive X-shaped sear marks on the food. Be sure to hit the grate with a wire brush before cooking to ensure that everything is burned off. For the most part, the paint stays on the grill, but over time it may come off. Be sure to store at least the grate away when you’re done using it, and ensure that it is fully cool before storage. The experience of cooking on the Texsport fire pit grate is a good one, and the adjustable height design is clever and makes for a higher quality grilling experience. You should adjust the grill to the height you’re looking for before starting the fire, as it is very hard to adjust the height once the fire is going and the grill is hot. Attempting to open the clamps and adjust with heat-resistant mitts on is really difficult, so get it to the right height before getting the fire going. The Texsport fire pit grill is a great design and solves one of the flaws that plague many fire pit grills for cooking: height. By creating an adjustable height design, this cooking system can be used in a wide variety of different fire pits, from traditional campground round fire pits to off the shelf fire pits, to copper fire bowls, etc. The experience of cooking with the Texsport grill is a good one, and the rotating feature is another bit of thoughtful design. At the price point, these are positioned, this is an excellent choice for a fire pit barbecue grill. The Sunnydaze X-Marks round fire pit cooking grill series is very similar in design and build quality to the square cooking grates mentioned above, but these are set up in a round format. They are available in seven different sizes, and as with all round objects, each small increase in diameter results in a much larger cooking surface. 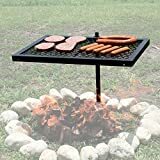 This grill is shown here with a grill tripod [Amazon link] that enables the grill to be positioned up above the fire pit. This set of fire pit barbecue grill grates is made very similarly to the square Sunnydaze X-Mark grills above. The materials are quite similar, and the X-Mark pattern is seared on your food as you cook it, which makes for very attractive food when it’s all ready. As is, it is designed to sit directly on top of a fire pit, and there is no height adjustment on this grill. This can make cooking complicated, as many fire pit designs are such that the wood actually sticks out above the upper lip of the fire pit, or there are other obstructions that make placing the grill right on the lip difficult. It can be hard to get just the right distance between the wood and the grill with these designs, and a tripod may be needed (as mentioned above) to get it positioned perfectly. If your fire pit is such that the grill can sit directly on the lip, then the Sunnydaze X-Marks Round selection is excellent. It’s made of steel and is quite sturdy. It can hold a huge amount of food, depending on the size you choose, and can rapidly cook large meals with ease. Be sure to scrub the grill with a wire brush before and after cooking, to ensure that the grill surface is properly clean. The grill may warp a bit upon first exposure to high heat, so be prepared for that. The warping does not impact the structure of the grill and is just aesthetic. It’s not ideal, but if you’re prepared for it, it’s probably not a big deal. If left out in the elements, these grills will rust and deteriorate. It is best to store them away from water, and moisture in general, and they should last a long time. Always be sure to wait until the grill is fully cooled before placing it in storage! The Sunnydaze X-Mark Round Fire Pit grill line is a great choice for those looking for large round fire pit grates, and who don’t really need to worry about height issues. The included handles make these pretty easy to use, and if properly cared for, they will last for years. The price on these generally isn’t cheap, but given the 1-year warranty, and the size and quality, these are generally a good choice. 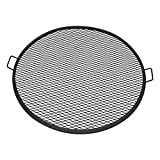 OUTDOOR GRILL GRATE DIMENSIONS: 36 inch diameter and weighs 14 pounds. DURABLE DESIGN: Barbeque grill features heavy duty steel construction with high-temperature heat resistant paint finish. In summary, all of the grill grates examined on our list today are pretty solid, and depending on the size and configuration you need, chances are the grill grate for you can be found on this page. If sizing is not a primary concern, then the Texsport Grill Grate is probably the best choice. If you prefer to have one to rest on the fire pit, then you should be able to find the right size for your needs with one of these. For runner-up options, the Sunny Daze X-Marks and Mr Bar-B-Q are both great choices if they’re compatible with your fire pit shape. Good luck, and good cooking! Where can one get the hooks that hold the grill (seen in the tripod photo)? You can find tripod grills on Amazon. These have a tripod frame, hooks and chain, and a grill. we’ll probably be doing a write-up on them eventually, but for now search for Tripod Grill on Amazon. Good luck!